This image from NASA's WISE telescope features the galaxies Messier 81 and Messier 82, which swept by each other a few hundred million years ago, and will likely continue to twirl around each other before eventually merging into a single galaxy. 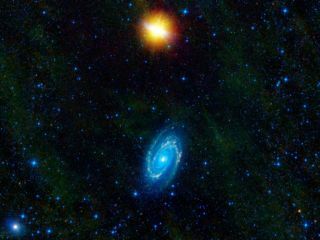 Two companion galaxies couldn't look more different from one another, a new photo from NASA's WISE telescope reveals. Though both are spiral galaxies, one beams a bright yellow light from the host of baby stars it is forming at a tremendous rate. The other, calmer galaxy glows in stately blue. The pair, called Messier 81 and Messier 82, swept by each other in a near-collision a few hundred million years ago. They are still close enough to feel a mutual gravitational attraction, and scientists expect they will eventually merge into one. Messier 82, also known as the Cigar galaxy, is the yellow one, made so bright when the interaction with Messier 81 stimulated furious star growth inside it. Its spiral arms are less visible because it's seen edge-on from the perspective of Earth. The yellow hues reflect gas and dust that have been blown out of the galaxy by the swarm of new stars. The more sedate Messier 81, or Bode's galaxy, also experienced some new star formation likely triggered by the tussle with its companion. The knots of yellow in its spiral arms represent these stellar nurseries. "What's unique about the WISE view of this duo is that we can see both galaxies in one shot, and we can really see their differences," Ned Wright of UCLA, principal investigator of WISE, said in a statement. "Because the Cigar galaxy is bursting with star formation, it's really bright in the infrared, and looks dramatically different from its less active companion." Because of Messier 82's furious star formation rate, it is known as a starburst galaxy. "It's striking how the same event stimulated a classic spiral galaxy in Messier 81 and a raging starburst in Messier 82," said WISE project scientist Peter Eisenhardt of NASA's Jet Propulsion Laboratory in Pasadena, Calif. WISE, which stands for Wide-field Infrared Survey Explorer, was launched in December 2009 to survey the entire sky in infrared light. The telescope had completed its main goal of covering the sky 1 1/2 times by October 2010, when it ran out of the coolant it needs to keep the instruments chilled. The observatory is still plugging along though, taking photos of astronomical objects in the two infrared channels that aren't affected by warmer temperatures. The new photo is shown in false color, because infrared light is invisible to human eyes. The shortest wavelengths in the picture are represented in blue and blue-green, while longer wavelengths of light appear green and red. In visible light, Messier 81 is one of the brightest galaxies in the sky. Both companion galaxies can be seen with binoculars in the constellation of Ursa Major, which contains the Big Dipper. They are about 12 million light-years from Earth.